We’d like to give a special thanks to Spirit Awakening, the organization that connected us with Zehani and her story. 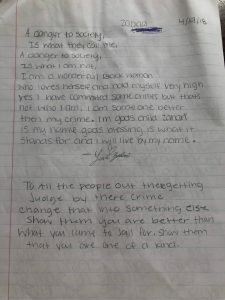 Spirit Awakening is a non-profit arts organization dedicated to helping at-risk youth and children in the juvenile justice system realize their spiritual identity. They use meditation, creative writing, improvisation and visual arts to build character and raise self-esteem one child at a time. They have spent the past 23 years teaching the unheard the power of positive and productive expression.